2012 Update: This may have happened last year, but Strawberry Cheesecake has been dropped from the Smooth & Dreamy line. Apparently Breyers doesn't do cake or pie flavors anymore. I'm guessing you may have seen the new blue Breyer's containers by now, but if not, it's time to take a look. The big problem we've been having with the light ice creams is that we always seem to lose the ability to keep it all natural. Well, no longer! Breyers comes to the rescue! Now the website says there are 11 smooth & dreamy flavors, but to be honest, up til now I've only scene the vanilla and maybe one other flavor (oh man, they make a rocky road flavor too!!). I don't mean to be sappy, or biased, or anything like that, but I'm really proud that a mainstream company like Breyers has taken the game up another notch. I'm growing tired of Edy's (Dreyer's) getting lazier. We've had to accept a shrinking package size, but I refuse to accept shrinking quality standards. Ok, let's get to the ice cream already! Now, the ice cream is very soft and wasted no time before starting to melt. Granted, there's no fun chemicals to hold it together, so this trade is totally acceptable, especially since I have no urge for those chemicals messing with the taste of my ice cream. It also looks really tastey, and the aroma is mild but pleasing (ok, technically I got a "little" too close when sniffing the ice cream...). So, how does it taste? Well, it varies. I'm no cheesecake lover, so I appreciate the bites that are mildly cheesy and pleasantly strawberry-ish. Unfortunately, for whatever reason, some bites are really cheesy. I don't know what it is, but every time I hit one of those bites I was dieing for a bit of crust to mellow it out. Note: there are no crust bits. This is cheesecake flavored ice cream with a strawberry swirl. call it truth in advertising, but it really is smooth and"dreamy". It's very soft and goes down real easy. I guess this would be opposed to smooth and creamy, as you might describe B&J or H-D. Granted, you'll probably eat it quicker, but you also don't feel weighed down when you're done. Plus it doesn't have the plastic/rubbery texture you might find in other light ice creams. Conclusion? I'm just not enough of a cheesecake lover to go back to this, but the quality of this product has me dieing to try some of the more appealing flavors. If Breyers keeps it up, this will become the defacto ice cream in the fridge for the nights I want something a bit lighter. Product Update: For all you cheesecake lovers, I'm sorry to announce that the Sara Lee Strawberry Cheesecake light ice cream from Breyers has been discontinued. At least we have S&D, but S&D doesn't have a graham cracker swirl. I must be way out of the loop.. 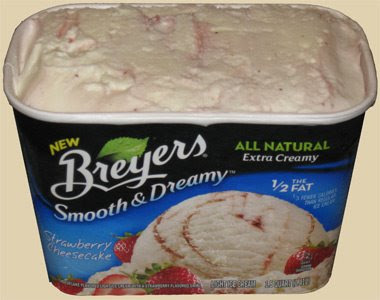 I keep looking for the Breyers ssara lee strawberry cheesecake ice cream... NOW THAT WAS FABULOUS !!!! there aren't any more sars lee strawberry cheesecake Klondike bars either......those were another fav.. what happened that I missed?